Kagoshima’s main attraction, the stately home and garden Sengan-en, looks like a movie set but the real entertainment lies in its complex role within Japanese history and the story of the Shimadzu family. While everybody eyes its northern and central counterparts of Hokkaido and Honshu, where much of the fallout from Japan’s tourism boom has landed, the discerning traveler’s attention is shifting gradually southwards —to Kyushu. One of Japan’s most underrated regions, Kyushu’s history tells a captivating narrative, one that features ancient civilizations, feared samurai clans fighting Western invaders, beautiful princesses, and a pivotal role in the birth of modern Japan. Better still, all the action takes place across a cinematic landscape of lush rolling rice fields, turbulent oceans, mystical cedar forests and smoking volcanoes. Of course, every story has a beginning. And there’s a little-known place in the seaside city of Kagoshima where you can immerse yourself in Kyushu’s chapter one: It’s called Sengan-en. As the southern tip of Japan, Kyushu has long been a gateway to the outside world. Many of its highlight destinations like Fukuoka and Beppu, incidentally host cities of the 2019 Rugby World Cup along with Kumamoto, are well-practiced at welcoming foreign visitors. But it was in Kagoshima where some of the first contact with outsiders took place. De-facto capital of the Satsuma domain, the port city functioned as a busy trade hub with China, and, in 1549 with the arrival of Jesuit priest St. Francis Xavier, it welcomed Christianity and Western ideas along with it. Three hundred years later, the city would come to blows with the British Royal Navy across the same stretch of sea during the Anglo-Satsuma War; a battle that would unexpectedly provoke an allied relationship between the two sides. Most famously, this is where Saigo Takamori, the Japanese hero depicted in the film, “The Last Samurai,” would lead the ill-fated Satsuma rebellion. All this was presided over by the ruling Shimadzu clan. One of the most powerful families on the archipelago, Shimadzu officially ruled Kagoshima for 700 years up until the Meiji Restoration, though they have continued to be just as influential in the centuries since. Their presence is marked everywhere in modern-day Kagoshima by a circular crest with a cross through the center. The 19th Shimadzu lord Mitsuhisa built Sengan-en in 1658, incorporating an extraordinary detail of borrowed scenery: Sakurajima, a majestic volcano that continues to erupt to this day, regularly sending plumes of ash thousands of meters into the air. On its exceptionally well-preserved surface, Sengan-en is a stunning Japanese stately home and garden, and UNESCO World Heritage Site. But still this description hardly does its 12 acres — which also includes a museum, a glassworks, shrines, shops, restaurants, a bamboo grove and a hiking course —justice. There are around 35 stops on the most comprehensive tour of Sengan-en and you should give yourself at least half a day so you’re not jogging the whole route. Staff guides recommend visitors to start at the first point of interest right after the entrance; the foundations of the old reverberatory furnace. In the years leading up to the Meiji Restoration —a period that saw the complete transformation of the country’s social, political and economic landscape —the Shimadzu family constructed the Shuseikan Industrial Complex within Sengan-en to bolster the local economy and strengthen the military might of the domain. Samurai used traditional craftsmanship to interpret pictures of a furnace in a Dutch textbook, built their own 20-meter high version and established Sengan-en as an incubator for Japan’s industrialization efforts. Conversely, to the left of the furnace is Tsurugane Shrine. Along with its relics; a suit of armor, a sword, and figures of members of the Shimadzu clan, the spirits of 31 generations of the family are enshrined in this evocative structure. One of these spirits, that of Kameju-hime, a beautiful samurai princess held hostage by a rival clan, is said to grant beauty to those who offer her a prayer (though there’s no indication how long it will take to have an effect). Back towards the garden and passing the shops and restaurants (see below), you’ll walk in front of the imposing Main Gate, the 1895 wooden entrance to the gardens. Don’t miss the small Jigen-ryu Exhibition Room to learn about this unique Satsuma style of swordsmanship, designed to kill with just one stroke of a sword. Samurai practitioners of Jigen-ryu apparently had a fearsome reputation, helping to win several decisive battles. Step through the red Tin Gate, the original way into Sengan-en and come face to face with the elegant stately home where the family lived and entertained guests in the late 1800s. Here ideas were exchanged with Japanese and international visitors, among them Edward VIII of the UK and Nicholas II of Russia. 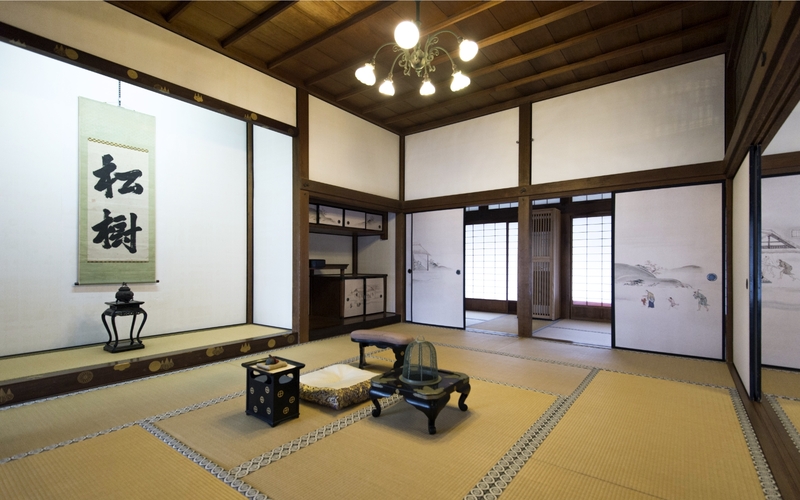 Explore the immaculate rooms of the Shimazu clan stately home. The rooms are preserved almost exactly as they would have been back in the day and visitors are free to roam around and play house. Through the bedrooms, study and dining halls, details down to the cutlery on the table are immaculately preserved, making it feel like you’ve stepped onto a movie set and Ken Watanabe might turn round the corner at any minute. Ethereal kimono-clad staff glide through the hallways, only breaking the spell when they stop to offer information and answer any questions you might have. With smoking Sakurajima puffing away in the near distance, the garden feels just as otherworldly. Strolling around you can map the influences that helped establish Sengan-en as a leading center for international exchange and domestic development. Shades of a traditional Japanese garden in the arched stone bridges, streams and curated flower beds at the front of the garden graduate into more wild, moss-lined pathways that wind around the back, leading to a hidden hiking trail that climbs all up to the site of a former pavilion, where magnificent panoramic views of Sakurajima and the bay lay in wait. While the volcano is a constant feature of the gardenscape, its colors change across the seasons; cherry blossoms in spring are replaced by rainy season-loving hydrangeas in June, and irises through summer into autumn before the chrysanthemum festival when 15,000 of the Imperial Family’s emblem, and symbol of longevity, cover the garden. Several shops line the lantern-lit pathway that leads from the ticket entrance the garden. Here you’ll need to take a break for jambo mochi, perfectly sweet-salty rice cakes local to Kagoshima, before browsing the gift shops for local souvenirs and Shimadzu-related products. Next to the Shimadzu Gift Shop is the Matcha Cafe; a slick tea ceremony and cafe space which elegantly pairs local tea and sweets. Two large restaurants sat slightly above the garden, Shofuken and Ohkatei, offer stunning views and an excellent menu of menu of Kagoshima delicacies including tender Kurobuta pork and locally caught sea bream. You’ll find the glassworks and museum adjacent to Sengan-en. Watch craftsmen and women at work blowing and cutting Satsuma Kiriko, a type of cut glass famous to Kagoshima that was originally produced to show cultural sophistication and technical skill to Western nations in the late 1800s. The technique for producing this glassware was lost for over 100 years, until being rediscovered at Sengan-en in the 1980s. Next door, the Shoko Shuseikan Museum lays out the long history and culture of the Shimadzu clan. Japanese history buffs will go in for the informative displays related to the Shimadzu’s part in innovating technology in Meiji era Japan —the only country in Asia to undergo an Industrial Revolution. 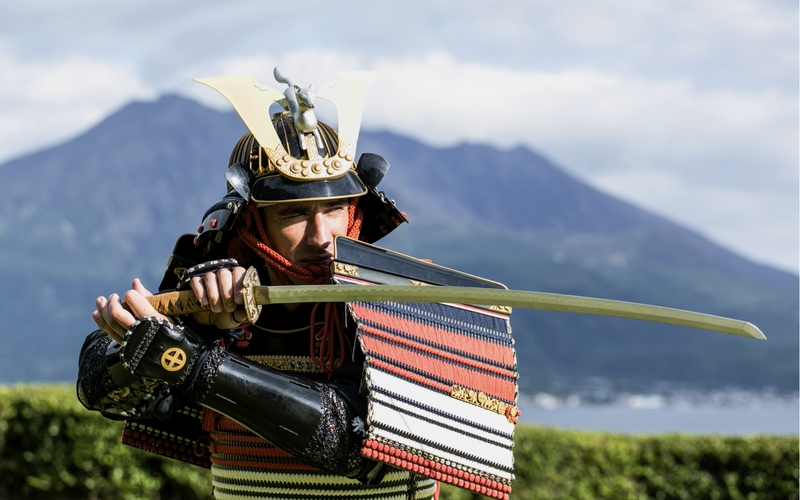 Snap some epic photos in replica samurai armor at Sengan-en. Visitors can further immerse themselves in Sengan-en’s rich heritage —by wearing it. Sengan-en offers the chance to don an authentic replica of the armor once worn by the legendary general, Shimadzu Yoshihiro. 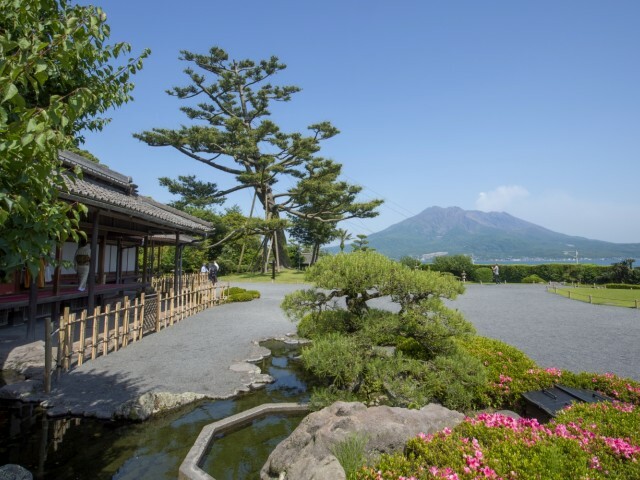 Knowledgeable staff will kit you out in a private room of the house, after which you can explore the garden and pose to your noble heart’s content against the epic backdrop of Sakurajima. Sengan-en is a real one-of-kind historical and cultural complex where a compelling past is presented in an immersive and impactful way. Every doorway, piece of furniture, shrine, flower and tree has a story behind it, making it an endlessly fascinating place to explore and come back to when in Kyushu. Using bustling Kagoshima city center as your base, it will take about 15 minutes to drive to Sengan-en. On the way, make a short detour to the hideout of Saigo Takamori where he hid before defeat with Imperial forces forced him to commit seppuku (ritual suicide) at another site, about 15 minutes away on foot. Make sure to also check out often overlooked bullet-hole ridden walls of the school where Saigo mentored the rebellious Satsuma samurai. Access: For public transport from Kagoshima city center, use the City View bus and get off at Sengan-en Mae bus stop. An alternative option is a taxi, around ¥1,500 from Tenmonkan or Kagoshima Chuo Station. Wonderful article! I keep a bag packed so when I have a day or two open, I can toss it in the car, call my dog, and kiss my wife goodbye for a quick trip from Kumamoto to Kagoshima. Its history is fascinating and scenery unparalleled. My last trip to Japan included three days in Kagoshima as a base from which to ride my bicycle. This was long enough for me to realize that I must go back. I really didnt have time to explore the history anywhere near enough and there is so much history there. It's a fantastic place & Sengan-en itself is lovely. I had the good luck to visit the garden just after an eruption of Mt. Sakurajima and you could still catch a slight smell of the volcano. Thanks for this article JT, Sengan-en looks fabulous. My wife and I have only had a brief taste of Kyushu (Fukuoka, Beppu, Dazaifu) which we loved and have always planned to return to, but this looks pretty special. I have a folder on my computer optimistically entitled "Japan Trip Ideas 2019" and this goes straight in there.